(Nanowerk News) When a team of university and industry researchers tried a novel, foundry-style mold-filling technique to make nanoscale devices, they realized they had discovered a gem. Not only did they pioneer a three-dimensional nanoscale fabrication method, they used the process to make ultra-hard, wear-resistant nanoprobes out of a material similar to diamond. On a larger scale, materials that look smooth still abrade because of slight irregularities and defects on their surfaces. However, at the nanoscale, atoms rub off one at a time, creating new challenges for researchers who build devices sometimes just tens of atoms wide. “The effects of friction are important in nanoscale devices and processes, where surface forces such as friction are increasingly dominant due to the high surface-to-volume ratio,” says Kumar Sridharan, a distinguished research professor of engineering physics at the University of Wisconsin-Madison and member of the research team. The team, which also included researchers from the University of Pennsylvania and IBM Research-Zurich, published details of its research Jan. 31 in the advance online edition of Nature Nanotechnology. The advance is key because it demonstrates a method for applying, in a three-dimensional nanoscale application, silicon-containing diamondlike carbon, or Si-DLC. In the study, the researchers showed that Si-DLC, which is prized for its low friction and high wear-resistance at the macroscale, also exhibits similar outstanding wear-resistance at the nanoscale. “It was not clear that materials that are wear-resistant at the macroscale exhibit the same property at the nanoscale,” says lead author Harish Bhaskaran, a former IBM researcher who now is a researcher in the Yale University Department of Electrical Engineering. Developed by Sridharan, the new “nano foundry” technique easily could scale up for commercial manufacturing. 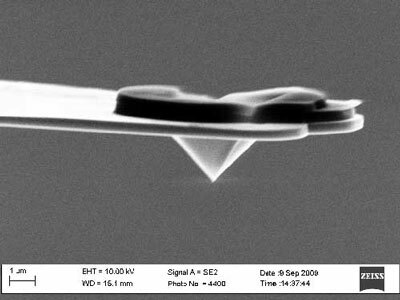 Using an IBM silicon-on-insulator wafer etched with sharp, pyramid-shaped “molds,” Sridharan used Si-DLC to fabricate ultrasharp tips, with a 5 nanometer radius, on standard silicon microcantilevers. In three dimensions, the technique works somewhat like the way in which a snowfall blankets the ground. In this case, the “snow” is ionized hexamethyl disiloxane, a liquid precursor to Si-DLC that gasifies in the plasma chamber and ultimately packs neatly into the molds on the IBM wafer. “Our process has allowed us to fill a very sharp tip, very accurately,” says Sridharan. Another advantage is that Si-DLC is an amorphous, rather than crystalline, material. If a crystal is too big, the mold will fill irregularly and limit the tip sharpness. However, an amorphous material can slide atom by atom into the mold, filling it completely, like raindrops into a bucket. In addition to filling the tip molds completely, Si-DLC also coats the entire wafer. The researchers developed a simple, commercially feasible two-step silicon etching process to release the tip and the integrated cantilever from the wafer. The tips have applications in atomic-force microscopy, data storage and nanofabrication. In wear tests, in which the researchers slid the tips continuously over a silicon dioxide surface for several days, they found the Si-DLC tips were 3,000 times more wear-resistant than silicon tips. “We’ve taken a material that’s good at the macroscale, we fabricate it at the nanoscale, and we show it’s wear-resistant at the nanoscale,” says Bhaskaran. Other authors on the Nature Nanotechnology paper include Bernd Gotsmann, Abu Sebastian, Ute Drechsler, Mark A. Lantz, Michel Despont, Papot Jaroenapibal, Robert W. Carpick, and Yun Chen.